choose an attraction to discover flight options! Baie-Saint-Paul is a charming town one hour northeast of Quebec City along the shores of the Saint Lawrence river. 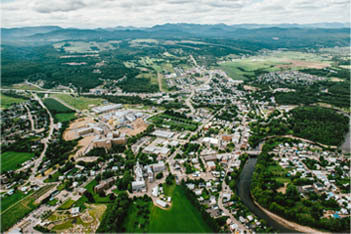 Nestled in the Charlevoix crater with the Gouffre river winding through its downtown, Baie-Saint-Paul is a must-see Charlevoix destination! Come on one of our flights featuring this attraction and you will get the chance to see the stunning geography surrounding this idyllic town. Feel the smile spread across your face as you admire this town and countryside that have been the muse to many a great artist! Hidden from sight in a breathtaking setting, the lighthouse at Cap-de-la-Tête-au-Chien is truly extraordinary! Escape to this off-the-beaten-track destination where you can breathe in salty air and watch as whales and belugas swim by. 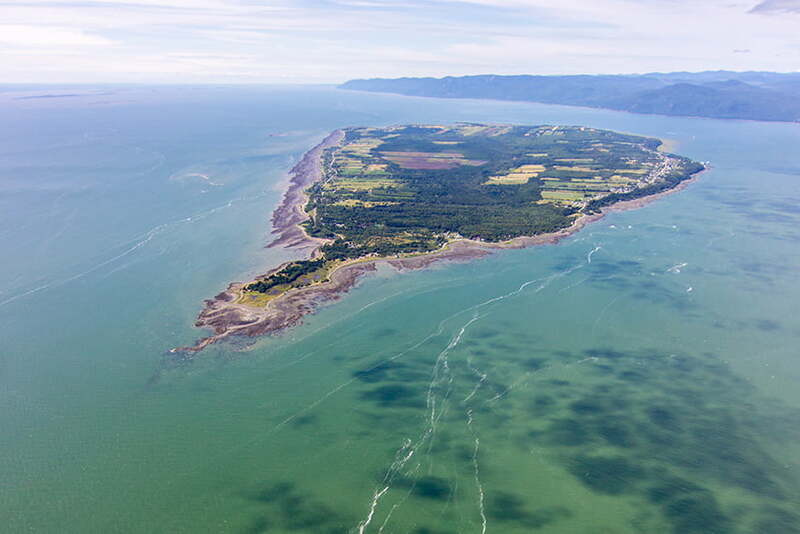 You may fly over Cap-de-la-Tête-au-Chien or be dropped off to experience it up-close with one of our adventure packages. FOR MORE INFORMATION... Visit this website. The Gouffre river was given its name in 1608 by French explorer Samuel Champlain. The river was named after the “gouffre” or whirlpool at the base of Cap aux Corbeaux just downstream from where the river empties into the Saint Lawrence. The whirlpool posed a formidable marine obstacle to sailors and was a source of significant fear for the local seagoing communities. The Gouffre watershed is made up of 185 lakes and 35 tributaries. 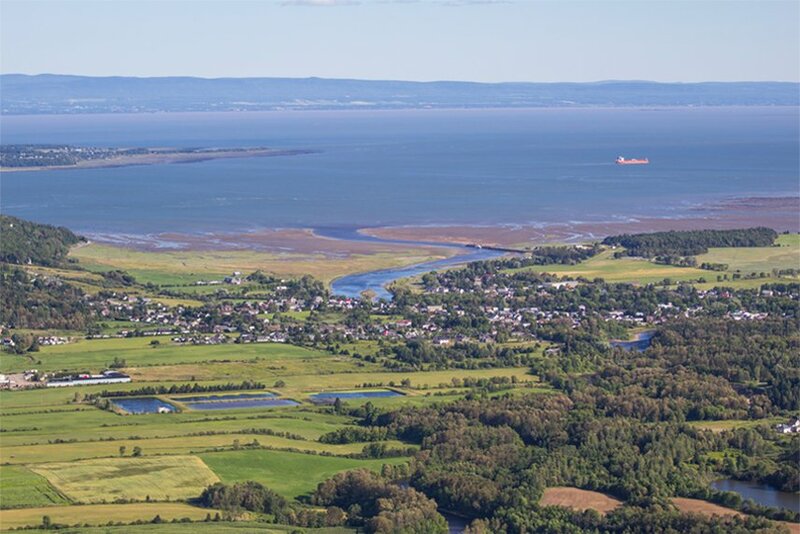 The river flows southwest for 76.1 kilometers before emptying into the Saint Lawrence river in Baie-Saint-Paul. FOR MORE INFORMATION... The Gouffre river is home to Atlantic salmon and trout. For information on fishing in the Gouffre visit the Salmon Quebec website here. Isle-aux-Coudres, an island with an area of 29.46 km2, was colonized by French settlers in 1720. Living from agriculture and fishing, these settlers had to find and make everything they needed to survive. They had no choice but to learn how to navigate the Saint Lawrence river 12 months a year. Their seagoing spirit is embodied in the island’s stunning landscapes and wild beauty. Soar over Isle-aux-Coudres and observe the immense Saint Lawrence river wrapped around this quaint and romantic Quebecois island. You may fly over the island, or be dropped off to experience it up-close with one of our adventure packages. FOR MORE INFORMATION... Click here to visit the official Isle-aux-Coudres website. Perched on the edge of the Saint Lawrence river, this elegant chateau built in 1929 is now situated adjacent to Casino Charlevoix. 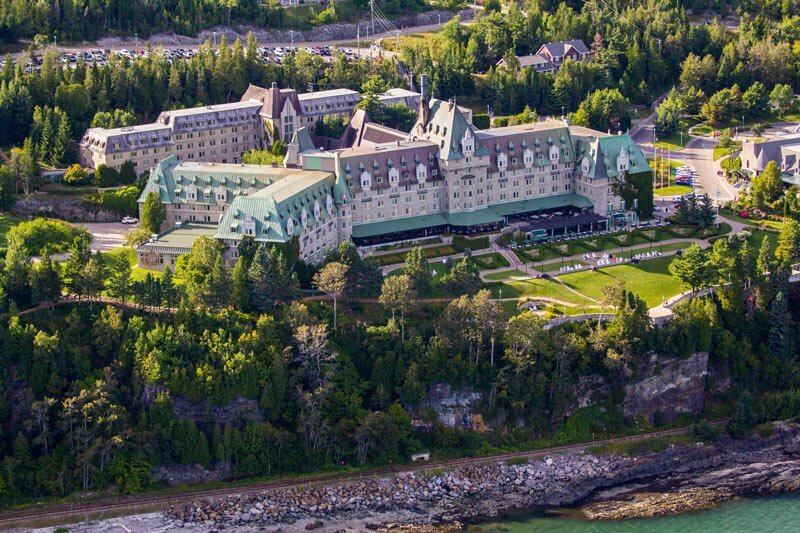 The Manoir, an establishment belonging to the internationally renowned chain of hotels, Fairmont, is a definite must-see Charlevoix attraction. Passionate about architecture, history and prestige? Don’t miss this unforgettable opportunity to admire Manoir Richelieu from high in the sky! FOR MORE INFORMATION... Click here to visit the official Fairmont Manoir Richelieu website. A favorite among our pilots, Mont des Morios offers a unique 360 degree view of the Saint Lawrence river and the Charlevoix mountains. When you reach the outskirts of Mont des Morios, you will be plunged into a totally exhilarating environment. Join us and feel a thousand miles away from the busyness and stress of the city. We guarantee that these striking mountainous landscapes will give you the change of scenery you’re looking for! Explore further along hiking trails with one of our adventure packages. You may fly over Mont des Morios, or be dropped off to experience it up-close with one of our adventure packages. FOR MORE INFORMATION... Click here to visit the official Charlevoix Tourism websiteor this website. The impressive Malbaie river flows southeast over a distance of 161 kilometers. 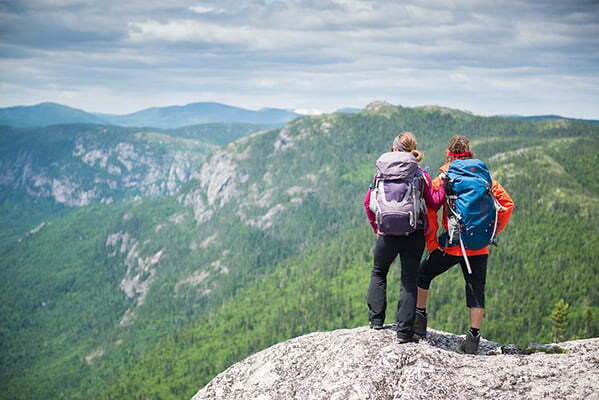 It begins in high backcountry peaks and ends in La Malbaie where it empties in the Saint Lawrence river. The view at the mouth of the river is enough to take your breath away! The river spans two provincial parks, Grands-Jardins and Hautes-Gorges and is home to 20 salmon pools! 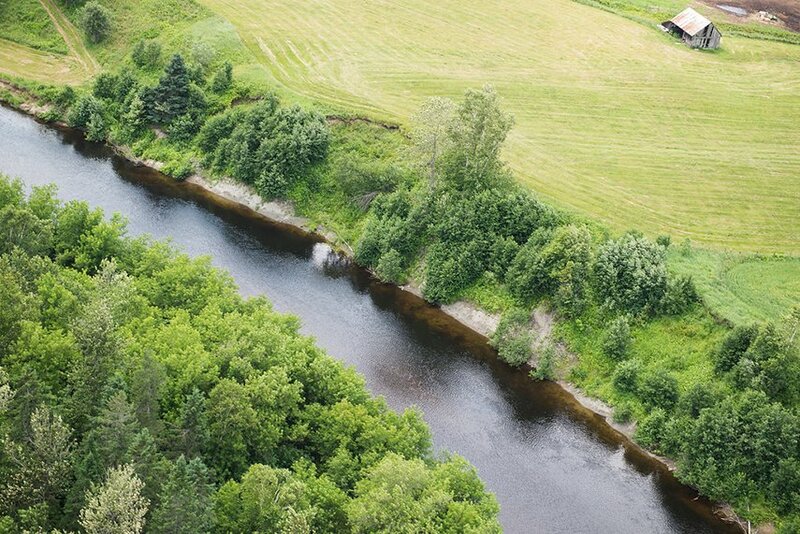 If you love fishing, nature, waterways and wide open spaces, this spectacular aerial view of the Malbaie river will blow you away! The outstanding Parc national des Hautes-Gorges-de-la-Rivère-Malbaie spans 224.7 square kilometers. This provincial park features a deep valley surrounded by steep mountain faces over 800 meters high. These faces are the highest in Eastern Canada! Cliffs, lakes and waterfalls adorn the park’s natural landscapes and create a unique ambiance that you simply must experience for yourself form the seat of one of our helicopters. Parc des Hautes-Gorges is one of the core areas of the Charlevoix biosphere reserve recognized by UNESCO. 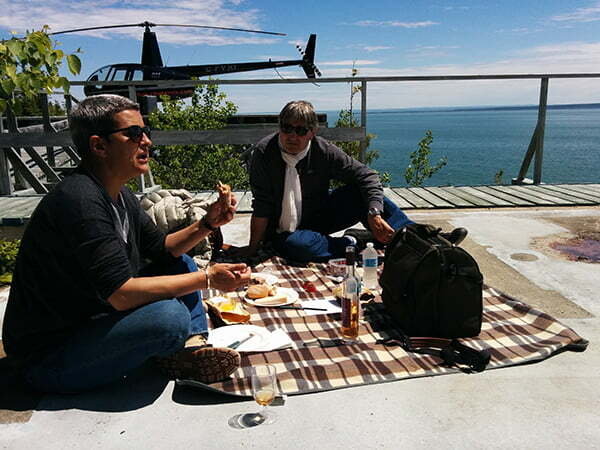 Get away with Héli-Charlevoix and experience the sublime Parc national des Hautes-Gorges from the skies! FOR MORE INFORMATION... Click here to visit the Sepac website. 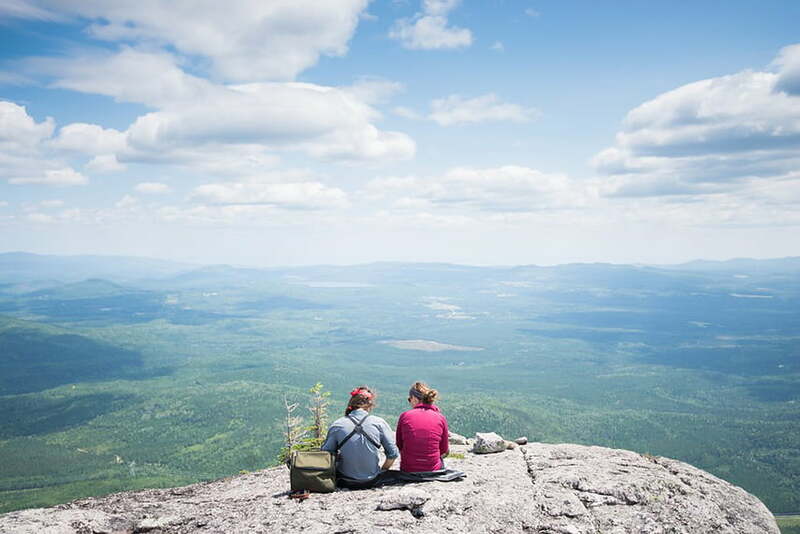 Nature and plant lovers will fall under the spell of the popular Parc national des Grands-Jardins. Spanning an awesome 310 square kilometers, this immense garden covered with lichens is an important part of Quebec’s natural heritage. Rustic vegetation shelters populations of moose, caribou, bears, wolves, as well as several lynx. The park is one of the core areas of the Charlevoix biosphere reserve recognized by UNESCO. The beauty of these landscapes shaped by wildfires, exceptional flora, rigorous climate and the fauna that live there is unique when viewed from the air! FOR MORE INFORMATION... Click here to visit the official Sepac website. 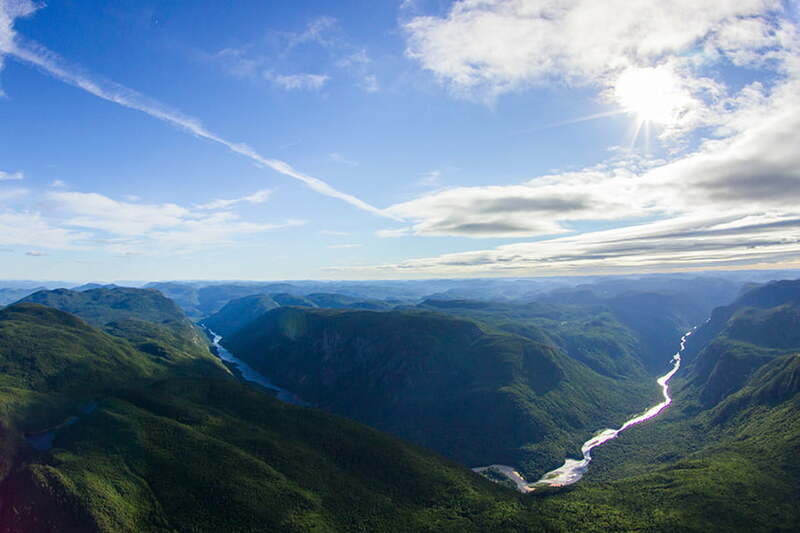 The majestic Saguenay Fjord is surrounded by stunning landscapes dotted with capes and steep cliffs. Marvel at this great beauty of nature while you soar through wide open skies on the adventure of a lifetime. The Saint Lawrence river is an extraordinary waterway that connects the Great Lakes to the North Atlantic ocean. At a length of almost 2000 kilometers, it is one of the largest rivers in the world. From high up in the air, the magnitude of this beautiful body of water will amaze you! Many of our flights and adventure packages will bring you soaring over this great beauty. 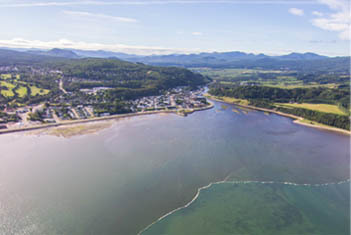 Saint-Irénée is a picturesque village overlooking one of Charlevoix’s most beautiful beaches. See these wooded, rolling hills dotted with farmsteads and lakes from above and you will fall in love with this quaint town. Admire the impressive architecture of Saint-Irénée’s world renowned music venue Domaine Forget. This village is a favorite among artistic types, as well as those who love shorelines, heritage houses and endless countryside. 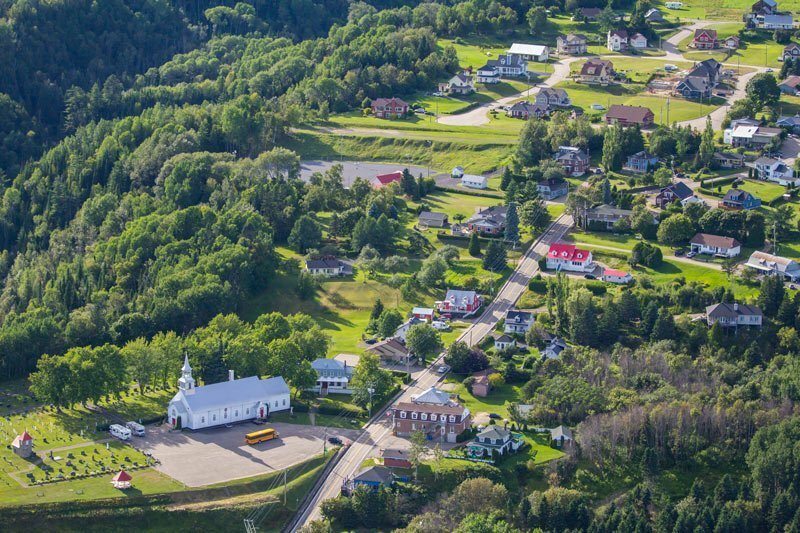 On several of our flights you will get the chance to experience this beautiful Charlevoix village from high in sky! FOR MORE INFORMATION... Click here to visit the official Saint-Irénée website.To learn more about Domaine Forget, a splendid arts center dedicated to the arts, music and dance, click here. 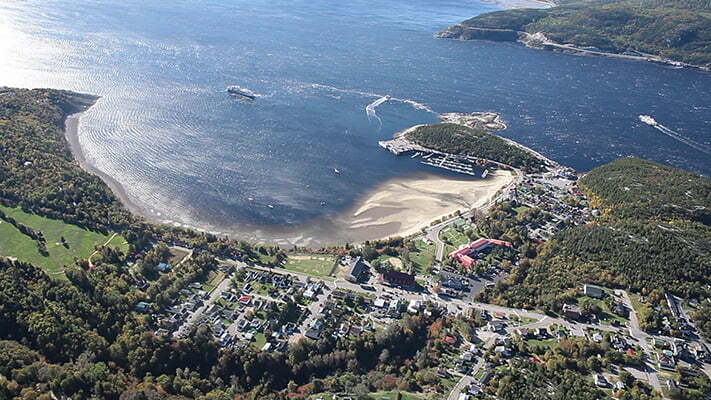 Tadoussac is an international hotspot for whale and beluga watching! Situated beside the estuary where the Saguenay Fjord dumps into the Saint-Lawrence river, Tadoussac is a breathtaking Charlevoix destination! 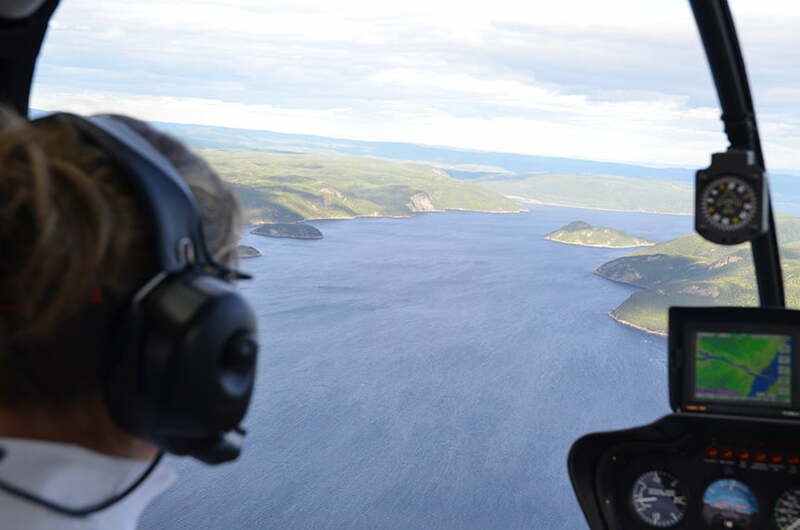 Come aboard one of our flights that feature this must-see Charlevoix attraction or customize your own helicopter adventure so you can experience Tadoussac’s magnificent marine life up-close! FOR MORE INFORMATION... Click here to visit the official Tadoussac website.